Mr. 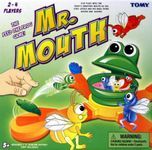 Mouth: The Feed The Frog Game! Edition of Mr. Mouth using a frog head as the centrepiece, produced by Tomy/International Playthings.